Joe Givan and Carol Massie created their story line magic act because magic happens in dreams. The first time Joe and Carol worked together was on “World’s Greatest Super Magician’s” T.V. show in Tokyo, Japan. Their first U.S. performance together was at the Academy of Magical Arts in Hollywood, CA,the “Magic Castle”. For 3 years, they traveled doing Performing Art Centers and Casino shows, including their own show at the MGM Grand in Las Vegas. Desiring a theatre of their own, in 2003 they opened their own Theatre of Dreams in Castle Rock, CO. and feature their own show as well as other world class performers. Close-up Cocktail Magic, Stage Shows, Client Appreciation, Family Parties, Mystery Dinners, Variety Acts, Casino Nights, Comedy, Awards Banquets, Team-Building, Emcees, Motivational Speeches, Recitals, Concerts, Card-Sharking Demonstrations, & More! Joe and Carol have performed at the world-famous Magic Castle in Hollywood, at major corporate events around the world, and numerous private functions. Our interactive magic is guaranteed to be the perfect entertainment for your group! Experience the excitement for yourself as we mystify your guests with world-class sleight of hand, and mind-reading leaving unforgettable magical memories. FAMILY FRIENDLY and sophisticated, too! is a Colorado native and received a magic kit at the age of 4. He was hooked instantly and did his first paid show at the age of 7. He won many piano competitions and had to choose between a career in magic or music. Choosing Magic as a career, he designed a competition act and in 1986 won the International Brotherhood of Magician’s 1st place award in close-up magic. In 1987, he won the Gold Cups International award of Excellence (one of 5 recipient in the 75 year history of the organization). The “Olympics of Magic”, known as FISM, was held in Holland in 1988 where Joe was awarded first place in close-up magic. As a creator and designer of magic and illusion, Joe consults for both David Copperfield and David Blaine, and others. Joe is a creator of original illusions. He is a worldwide lecturer on the art of creating and performing illusions as well as an author of several magic books. Joe Givan has designed custom illusions for major corporations – IBM, Xerox, Apple, AT&T, Pepsi, etc; his creativity has been sought by performers such as David Copperfield, David Blaine, Guns & Roses, as well as Alice Cooper’s “Brutal Planet” and Six Flags Amusement Parks. In March 2017, Carol and Joe performed in the live show for international TV in Las Vegas on Penn & Teller’s Fool Us world-class magic show! was born in Ohio, and her first time on stage was playing piano as a Miss Ohio finalist. During college, Carol began doing illusion shows at hotels and local resorts and set her sights upon cruise ship entertaining. After graduating with two degrees, Carol was hired by Carnival Cruise Lines to try her illusion act on board for 3 months. Still on ships, 5 years later (after being a Cruise Director for 3 of those years), Carol “landed” a job at Resorts International in Atlantic City, Germany, Korea, Canada, Japan, “Spellbound” at Caesar’s Palace, and numerous other casino venues in Las Vegas. She wrote a column for Genii Magazine called Cruise News. Carol met Joe Givan while performing at Magic Island in Houston, Texas and soon after, they created Dream Masterz Theatrical Illusion Show. She has been a full-time professional magician since 1985. Carol met fellow magician, Joe Givan while performing at Magic Island in Houston, Texas and soon after they created Dream Masterz Theatrical Illusion Show. 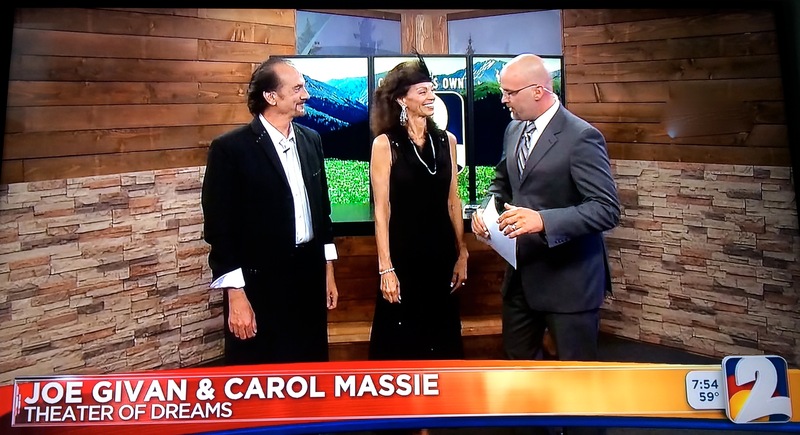 Joe and Carol opened their own “Theatre of Dreams”in April, 2003 and have received enormous accolades from the worldwide magic community for their contribution to the art of magic! They were featured in a 4-page article in the June 2015 issue of MAGIC Magazine and since then, there are more theatres patterned after their popping up across the country, just like magic!